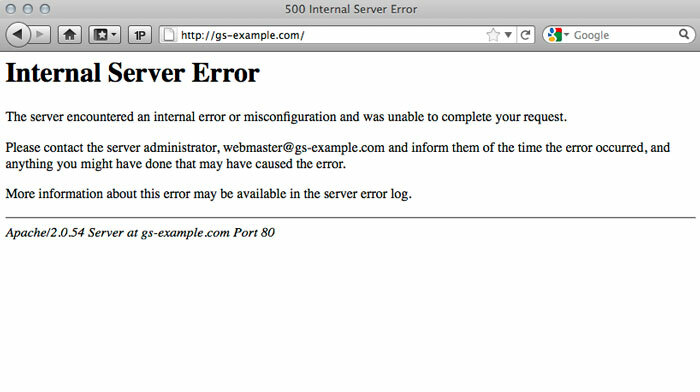 500 Internal Server Error is a generic error message, given when no more specific message is suitable. There are a number of causes for a 500 Internal Server Error to display in a web browser. Below is a sample error message. This article provides information on the most common causes. With any error message, particularly one as broad as the 500 Internal Server Error, you will first want to check any Apache and PHP error logs for your server. These logs can provide valuable context related to any code failures or other potential causes of a site failure. For information on where to find the logs for your server, please see: Where are the access_log and error_log for my server? If you are using a .htaccess on your site, it may be interfering with the web page you are trying to load into your browser. Please double check the .htaccess configuration. Any syntax errors will cause a 500 Internal Server Error message to be displayed instead of your website. To confirm whether a misconfiguration .htaccess is the cause of the 500 Internal Server error, either remove or rename the .htaccess file temporarily and then try to reload the page. If your PHP script makes external network connections, the connections may time out. If too many connections are attempted and time out, this will cause a "500 Internal Server Error." To prevent these time outs and errors, you'll want to make sure that PHP scripts be coded with some timeout rules. Typically, however, catching a timeout error when connecting to a database or externally to remote resources (example: RSS feeds) are difficult. They, in effect, freeze the script from continuing to run. Removing any external connections can increase both the performance of your website and decrease the chances of you receiving a "500 Internal Server Error." If it is a web page ending in .cgi or .pl that is producing the error, check your script for errors. For detailed troubleshooting tips, please see: Troubleshooting CGI/PERL scripts. When editing your CGI script, use a plain text editor - a program that saves the file as a 'text file' type. DO NOT use Wordpad that comes with Microsoft Windows because it doesn't save files in pure ASCII text format. Use Notepad instead to edit files. Upload your CGI scripts in ASCII mode into the cgi-bin directory. Set the file permissions on the CGI script file and directories to be chmod 755. If you use an FTP program to transfer files, right-click on the file and select change file attributes. See Using FTP and SFTP for more information. Double-check that the Perl modules you require for your script is supported. For a list of the currently supported Perl modules, please click here.